Incandescent blue sockpuppet-like monsters made only for assisting others, meeseeks made their debut in the fifth episode of Dan Harmon and Justin Roiland's hit Adult Swim show, Rick And Morty. While meeseeks are not born into this world fumbling for meaning, Reddit user doswarrior has created a search engine for all Rick And Morty fans (Mortians? Rickheads?) seeking various Zardoz images or the latest episode of Ball Fondlers. At www.meeseeks.com, users are greeted by Mr. Meeseeks’ high-pitched introduction, while clicking on Search treats them to another pledge of his helpfulness. 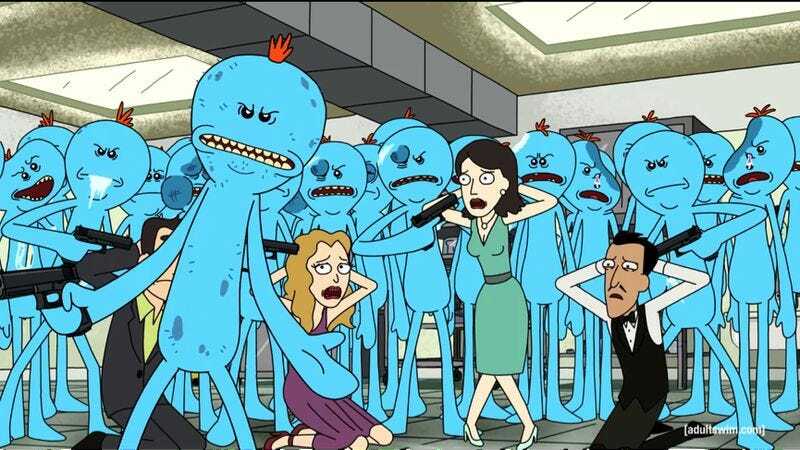 No word yet on when all of the various shows seen in “Rixty Minutes” will become YouTube channels, though consider us already subscribed to “Ants In My Eyes Johnson.” To learn more about your trusty new guide to the web, watch the “Meeseeks And Destroy” episode via the Adult Swim link below or read Zack Handlen's review.